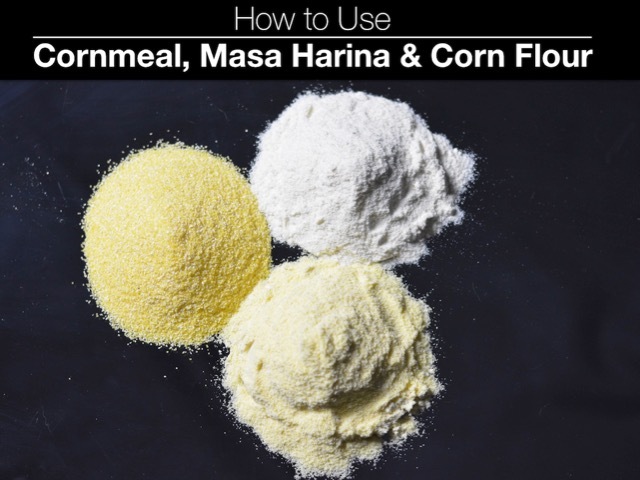 How to Use Corn Flour, Cornmeal and Masa Harina is post #4 in my series on How to Use gluten free flours. These corn products give gluten free bakers a lot of options so I keep all three in my pantry. This brief overview talks about the differences between each of these products and how to use them. If you are only interested in the recipes then skip straight to the end of the post to see the list. Before we start let’s make sure we know what we’re not talking about. In North America cornstarch is a fine white powder used to thicken sauces. It is made from corn but it is not the same as corn flour so they are not interchangeable. Cornstarch is a common ingredient for cooking so is probably in your cupboard. In this post I am not talking about cornstarch. I wrote about it in How To Use Starches in gluten free baking, post #2 in this series. To complicate the matter, cornstarch in the UK is called corn flour. When searching the web for recipes make sure you know where your recipe comes from. If in doubt you can consult Siri or Google…or just move on to another recipe. Corn flour is dried corn that has been finely ground into flour. It is a pale yellow colour but can also be white if made from white corn. If you have done any gluten free baking you may know that not every manufacturer grinds their flour to the same degree. However, if you look at corn flour and cornmeal side by side you can see the granules of corn meal compared to the dust of corn flour. Corn flour can be purchased at health food stores, Mexican and Latin American food shops. Online Bob’s Red Mill sells corn flour. Cornmeal also starts with dried corn but it is coarsely ground and these coarse granules provide a texture that many people love. Depending on the manufacturer the grind may differ slightly and not all cornmeal is made in a gluten free facility so check the label. There are now so many types of cornmeal available it can be difficult to know which one to buy and how to substitute. For the everyday home cook (that’s me) it’s easy. I just buy a gluten free brand. That requires a trip to a Mexican or Latin American food shop for me as the cornmeal brands I see in the grocery store includes may contain wheat on the label. Online Bob’s Red Mill and Arrowhead brands advertise gluten free cornmeal. In Canada Clic brand now displays the Certified Gluten Free symbol on the package and is available in large grocery stores. What About Polenta and Grits? Manufacturers label food for the purpose of selling it. In an effort to help the consumer a package of cornmeal may say polenta or grits. It may in fact be ground to a different degree, or not. This information may be helpful to some but can also be confusing. Here is my take on cornmeal labels. Polenta is an Italian dish made with medium ground cornmeal. If you are Italian you may have more criteria for purchasing cornmeal to make polenta. I’m not Italian. Grits are a southern specialty made with a grind of corn that is more coarse than the typical baking cornmeal. If you are from the south you may have a lot more to say about that. I’m not from the south either. Masa harina, sometimes simply referred to as masa, has a distinctive flavour that comes from the process of soaking dried corn flour in slaked lime then drying and grinding it a second time. It is used to make Mexican specialties like corn tortillas and tamales. A popular brand of masa harina is Maseca and some recipes call for it using this name. Masa harina can be found in Mexican, Latin American and specialty food shops and online. Bob’s Red Mill also sells masa harina online. Corn flour can be used like any flour in both sweet and savoury recipes as well as a component in recipes for breading meat and fish. For baking cornmeal it is most often combined with flour. Corn flour is a good choice but you can experiment using a gluten free all-purpose flour or mix of your choice. To use masa you simply add water and the instructions are written on the outside of the bag. Making tortillas is easiest with a tortilla press but it isn’t essential. Tamales are masa wrapped around some tasty morsel that is then wrapped in a dried corn husk and steamed. This requires a little more time but is a fun cooking project if you like kitchen parties. Masa can also be used right out of the bag to thicken gravy. This is the fourth in a series of blog posts on gluten free flours. My intention is to provide a basic overview of several gluten free flours for the everyday home cook, both new and experienced. Let me know in the comments below if you have a specific problem with your baking or a tip you’d like to share.